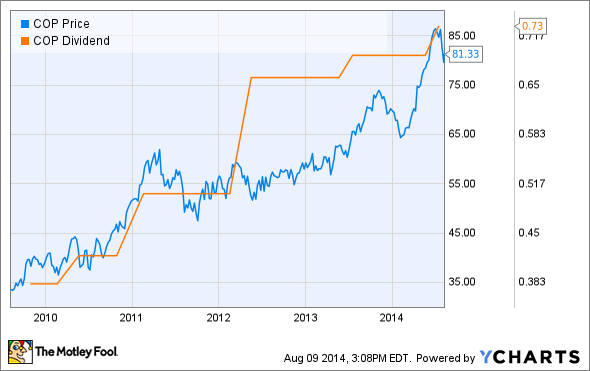 ConocoPhillips has a plan that should fuel a rising stock price in the years ahead. ConocoPhillips' (NYSE:COP) stock is up over 21% in the past year. That's just ahead of the broader market, which is up about 20% over the same time frame. Despite those gains there are a number of reasons why investors should continue to be bullish on the stock. Three reasons in particular stand out, and while their existence doesn't guarantee the stock will rise, they do give investors hope that ConocoPhillips' stock can continue to outperform. For an oil and gas company, production growth is typically the metric it trumpets. Since it has no control over oil and gas prices it focuses on what it can control, which is drilling new wells. ConocoPhillips, however, takes its growth a step further as it focuses on growing production that will also grow its margins. Because of this dual focus the company believes that between now and 2017 it can deliver 3%-5% production growth each year along with 3%-5% margin growth. This should grow its cash flow by 6%-10% each year. With opportunities that span the globe, ConocoPhillips can focus its capital on the areas that will deliver the highest margins. This is an approach many of its independent oil and gas peers simply can't take as many are focused on just one geography or in some cases only one basin. Because it has options that others don't, ConocoPhillips is allocating 45% of its annual capital budget to areas that have margins per barrel of oil equivalent of at least $40, as the following slide notes. By focusing its growth on what will move the needle on its bottom line the company expects its cash flow from operations to grow from $15.8 billion in 2013 to $20-$23 billion in 2017. That cash flow growth could fuel a rising stock price in the years ahead. ConocoPhillips recently raised its dividend by 5.8%, and the stock now yields 3.6%. However, that dividend should continue rising in the years ahead. As I noted already, ConocoPhillips' production and margin growth plan is expected to deliver 6%-10% in annual cash flow growth. By 2017 the company is expecting to produce nearly $5 billion more cash flow each year than it produced last year. Some of that cash flow will be used to give investors additional dividend increases. That's good news for stock holders for two reasons. First, investors get more income. However, another big benefit is that a rising dividend tends to be met with a rising stock price as the higher yield draws in new investors. This is just what has happened over the company's history, as the following chart points out. ConocoPhillips' current growth plan takes it through 2017. However, the company doesn't plan on just maintaining the status quo after it completes this phase of its plan, as the company is already focused on growth beyond 2017. ConocoPhillips has several compelling exploration and appraisal projects in the works that offer a lot of upside. Four areas really stand out: North American unconventional, the Gulf of Mexico, Angola, and Senegal. ConocoPhillips has already had a lot of success in North American unconventional shale plays like the Bakken and Eagle Ford shale. However, the company also sees great potential in the Permian Basin, Niobrara, Montney, and Duvernay. ConocoPhillips has noted that early appraisal results have been encouraging, which suggests that all four have the potential to be developed into real production and margin growth drivers in the future. Meanwhile, ConocoPhillips and its partners have already made four discoveries in the deepwater of the Gulf of Mexico, and the company hopes to make similar discoveries off the coasts of Senegal and Angola. The development of these exploration plays could fuel a rising stock price in the future as the company turns resource potential into production. ConocoPhillips is confident that its plan to grow production and margins by 3%-5% each year will yield 6%-10% cash flow growth over that same time frame. Add in a compelling dividend and exploration upside and these are three really good reasons why ConocoPhillips' stock could keep rising.